Attic conversions are a cost effective way to expand living space within your home, and our home remodeling company will deliver! Let us give you an exceptional living space that meets you and your family’s needs. When it comes to all types of room additions, we will put our over 30 years of experience of building and design to work for you! We set ourselves apart from the competition with our expert in house designers, custom tailoring every attic remodel to your needs. Let us show you the potential your attic has, and contact us today! When it comes to attic conversions, style, spacing, and pricing points all differ for our clients. What doesn’t change is the level of customer service and the quality of our work. We know that having an attic conversation is an investment in your home. We make sure to maximize every remodeling dollar. We consider your wants and needs during the project planning. We want to help you achieve a comfortable, functional attic space. 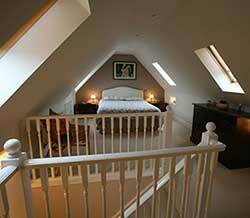 After all, making the decision to use attic space for bedroom conversions is a smart one! Recent studies show that homeowners get a 77.2% return on their investment. That’s pretty impressive! Our clients always revel in the selection and quality of the materials we use. This variety allows every client to get what they want during their attic conversion. 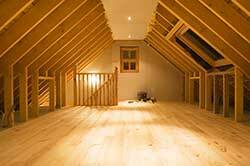 How to transform and use attic space is a personal choice. This clean slate option is really attractive for homeowners. Want to incorporate an office and work space? How about a craft room, bedroom, or media room? We can match your vision with the art of science of design and construction. Ready for the next step? It’s time to use every square foot of your home to your advantage. Give our remodeling company a call today! When it comes time for your attic remodeling project, make us your contractor of choice. Nothing is more frustrating that trying to juggle service providers! We can handle every aspect of your attic conversion process. From start to finish, you only deal with us! This allows you to only deal with the fun part! Enjoy watching your new attic conversion come together and not frustrating phone tag and scheduling conflicts. We can also do a dormer addition when we redo your attic, or any room for that matter. Adding windows into the design plan can have a dramatic effect on the space. For example, it allows natural light and better air flow. These little pocket spaces allows clients to enhance the room with personal touches. These could include a built in bed or a reading nook. It also provides a nice contrast for storage and shelving. Whatever the need for your attic conversion, we welcome the chance to sit down with you and draft your ideas. Together, we can build an amazing space at a great price! We do attic conversions in Carmel, Fishers, Noblesville and nearby cities.